There are no comments for Rocky Mountain Twin Peaks Bw. Click here to post the first comment. 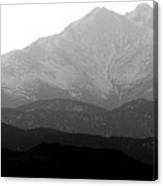 The Colorado Rocky Mountain Twin Peaks.Boulder County. Mt. 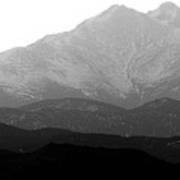 Meeker 13,955' on the left and Longs Peak 14,255 on the right with the layering foothills leading up to them. 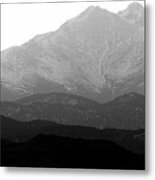 Buy this reasonably priced black and white fine art Colorado nature landscape photography print to decorate your office walls, home walls, cafe, restaurant, boardroom, waiting room or almost any commercial space. Fast, Secure world wide shipping to your door. Wall prints are also a great gift idea. Please feel free to browse our other fine art print galleries for more fantastic striking prints guaranteed to liven and class up any decor. This Image is also available for stock photography and non exclusive licensing. Contact directly for a custom price quote.